Although all seasons are wondrous in their own way, I have to say that the autumn has to be my favorite! The beautiful colors of the changing leaves coupled with the cool crisp air creates a nice transition to the holiday season. The selection of goat milk soaps that I chose for our Seasonal Favorites/Autumn Goat Milk Soap Collection Gift Crate are fragrances that to me, represent the fall/holiday season. The pink color of our Harvest Cranberry Soap, along with its fresh, earthy scent makes this a New England favorite and our all-natural Old Fashioned Peppermint Stick Goat Milk Soap, with botanicals mixed throughout, has a strong peppermint aroma that is sure to spice up your next bath or shower. Christmas Memories Goat Milk Soap has a combination of the fresh, balsam scent of the Christmas Tree blended with the aromas from some of the traditional holiday spices like cinnamon and clove. This soap collection makes a wonderful gift for anyone that loves to be pampered by all-natural, high quality goat milk soaps and for anyone that enjoys fragrances from the autumn/holiday season! Celebrate fall, with our Seasonal Favorites/Autumn goat milk soap collection. Each Seasonal Favorites/Autumn Soap Collection Gift Crate includes a re-usable pine crate, wrapped in cellophane and embellished with a festive holiday bow, 1 bar of Harvest Cranberry Goat Milk Soap, 1 bar of Old-Fashioned Peppermint Stick Goat Milk Soap, 1 bar of Christmas Memories Goat Milk Soap and one ‘Why Goat Milk?’ informational card. We include a blank holiday card for you to write a message; or, if we’re sending it directly to the recipient, we are happy to write your message. 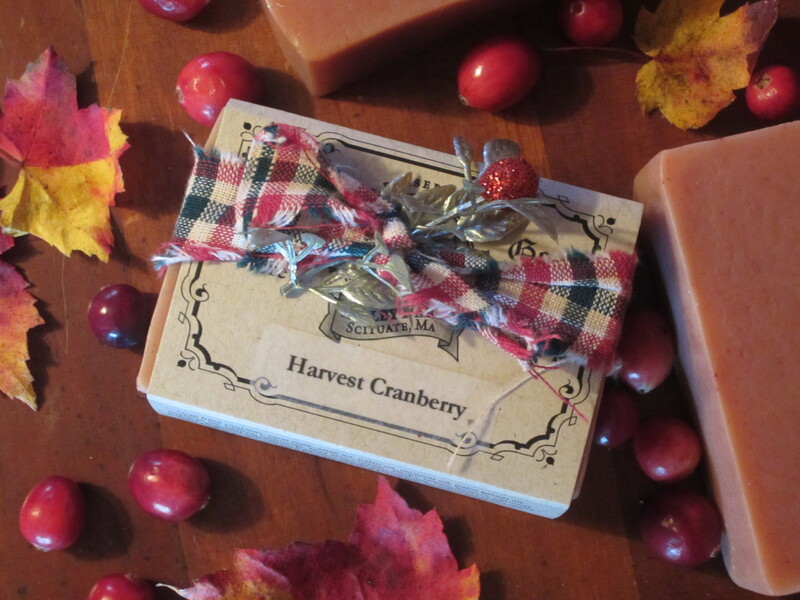 If you enjoy celebrating the autumn, they you will love our Harvest Cranberry Goat Milk Soap! The lush, sudsy lather that it creates, along with its fresh, earthy scent, makes it worth having with your next bath or shower. This all-natural, hand cut soap is of the highest quality and is sure to please. Using fresh goat milk as its base, this cranberry goat milk soap will leave your skin feeling soft and supple, unlike other commercial soaps. The authentic pinkish ‘cranberry’ color of this hand-crafted soap makes it a great candidate for display too! A New England Favorite for sure. Our all-natural Peppermint Stick goat milk soap has a strong peppermint scent with botanicals mixed throughout. The delightful combination of the botanicals, coupled with the relaxing scent of the peppermint, makes this soap a winner! So, breathe deep and say goodbye to dry skin and stress; indulge yourself with some Old-fashioned Peppermint Stick Goat Milk Soap. The gentle exfoliant of the botanicals, the therapeutic aroma, along with the rich, moisturizing lather from the goat milk, is sure to relax and comfort you! This seasonal favorite, captures the essence of what ‘home’ for the holidays is all about. The crisp, fresh, piney scent of the Christmas tree combined with the soothing aroma from the cloves, cinnamon sticks and dried berries, immediately transports me to the many Christmases of my youth. The wondrous, fragrant lather generated by this soap is sure to recreate all of the magic and wonder of Christmases past. Give yourself the gift of nostalgia and take a bar of Christmas Memories Goat Milk Soap into your next shower and enjoy! It is easy to see how this soap made it into our Fall Seasonal Favorites Soap Collection!